DILLON VALLEY – Two-for-one season has come early for students at Dillon Valley and Silverthorne elementary schools. A federal grant of $50,000 per school paid for two fun-filled days of science exploration, while their teachers strategized on ways to boost academic performance. The schools received the federal funding to support intensive, school-wide assessments of their reading, writing and math programs. The two schools were eligible for the funds because of their high percentage of economically disadvantaged students. Experts from the Colorado Department of Education visited the schools, interviewed teachers and parents, examined curricula and schedules and observed staff meetings. They then presented their evaluations and recommendations to each school’s entire staff during separate two-day retreats. Many Colorado schools that participate in the program cancel school for students while their teachers take part in the assessment meetings. Summit School District officials opted instead to provide the children with hands-on, science enrichment activities. “We just put our heads together and thought, ‘Who in the community can help us with this?’ Keystone Science School came up pretty quickly,” Hulbert said. Keystone Science School instructors served as substitutes in both schools’ third- and fourth-grade classes during the staff retreats. They spent two days learning about water cycles and forest ecology, dovetailing with the students’ existing science curriculum. 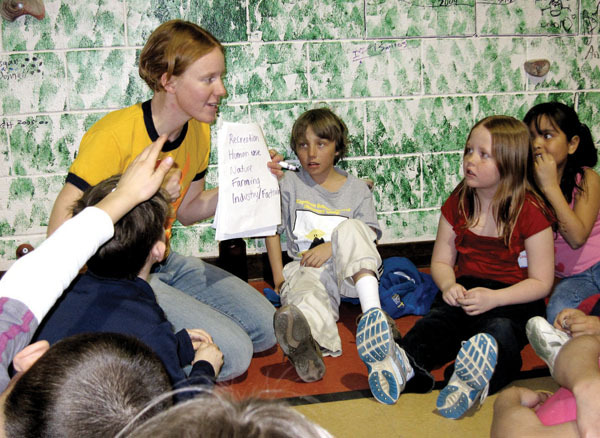 On Monday afternoon, Dillon Valley’s fourth-graders sprinted around their gymnasium, playing an ecologically themed game of tag. Each student was assigned a species of wildlife and was tasked with finding its appropriate habitat, represented on posters throughout the room. Later on, the students met in small groups to discuss water’s role in the various habitats and competing uses for the water. Fifth-graders got a dose of hands-on science, as well. They worked with district math specialist Karl Topper on chemistry concepts, including static electricity, atoms and states of matter. First- and second-graders focused on math and literacy through special multicultural lessons with the district’s technology team. All the activities – for both students and staff – were paid for with the grant funds. The schools will receive an additional $100,000 over the next two years to implement the recommendations and plans developed during this year’s assessment process.